Our team was composed of fourteen physicians and other individuals who provided logistical support. We provided care for the people of San Pablo, which is about ten miles east of Masachapa. Three clinical sites were set up: dental, surgical, and medical, which included a small laboratory and pharmacy. Over the course of four and a half days, we treated over 1,400 patients. 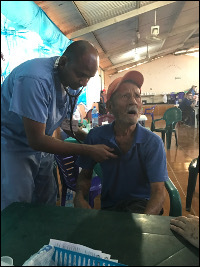 When necessary, a national physician was present to facilitate care for those we did not have resources to help by providing additional referrals and prescriptions. Nicaragua’s health care infrastructure is inadequate to meet the needs of the people. Coordination of care is lacking, and access to basic medications is limited due to the low disposable income of the average person. My biggest concern was for those people who we found to have more serious diagnoses, including a young man with an obvious psychiatric illness who ended up being HIV positive. I hope he is getting the care he deserves, but I may never know. I am grateful for the opportunity to provide medical care with Global Health Outreach. My intention is to continue to serve and utilize my medical training in this capacity in the future. It was truly rewarding to witness the gratitude of the people I treated despite the small contribution I made.